Munificentissimus Deus (Latin: The most bountiful God) is the name of an Apostolic constitution written by Pope Pius XII. It defines ex cathedra the dogma of the Assumption of the Blessed Virgin Mary. It was the first ex-cathedra infallible statement since the official ruling on papal infallibility was made at the First Vatican Council (1869–1870). In 1854 Pope Pius IX made an infallible statement with Ineffabilis Deus on the Immaculate Conception of the Virgin Mary, which was a basis for this dogma. The decree was promulgated on 1 November 1950. "By the authority of our Lord Jesus Christ, of the Blessed Apostles Peter and Paul, and by our own authority, we pronounce, declare, and define it to be a divinely revealed dogma: that the Immaculate Mother of God, the ever Virgin Mary, having completed the course of her earthly life, was assumed body and soul into heavenly glory". Pope Pius XII's previous encyclical Deiparae Virginis Mariae (1 May 1946) to all Catholic bishops stated that for a long time past, numerous petitions had been received from cardinals, patriarchs, archbishops, bishops, priests, religious of both sexes, associations, universities and innumerable private persons, all begging that the bodily Assumption into heaven of the Blessed Virgin should be defined and proclaimed as a dogma of faith. This was also fervently requested by almost two hundred fathers in the Vatican Council (1869–1870). Following the example of Pope Pius IX, who canvassed Catholic bishops before proclaiming the dogma of the Immaculate Conception, Pius XII asked all bishops for their opinion. "Actually God, who from all eternity regards Mary with a most favorable and unique affection, has 'when the fullness of time came' put the plan of his providence into effect in such a way that all the privileges and prerogatives he had granted to her in his sovereign generosity were to shine forth in her in a kind of perfect harmony. And, although the Church has always recognized this supreme generosity and the perfect harmony of graces and has daily studied them more and more throughout the course of the centuries, still it is in our own age that the privilege of the bodily Assumption into heaven of Mary, the Virgin Mother of God, has certainly shone forth more clearly". At issue was not the belief in the Assumption, but its dogmatisation. Munificentissimus Deus reports popular acclaim and "nearly unanimous" approval of the contemporary bishops. The names of the bishops attending the dogma celebration in 1950 are listed at the entrance of St. Peter's Basilica. The decree surveys theological history, especially the history of the belief in the Catholic Christian tradition, ... "the holy Fathers and Doctors of the Church have never failed to draw enlightenment from this fact", Munificentissimus Deus reviews the history of Catholic liturgy and the many liturgical books, ... "which deal with the feast either of the Dormition or of the Assumption of the Blessed Virgin", and the teaching of previous popes. Munificentissimus Deus cites also the teaching of previous bishops and such writers as John of Damascus, Francis de Sales, Robert Bellarmine, Anthony of Padua and Albert the Great among others. "In the theology of Pope Pius XII, the Assumption of Mary's body and soul into heaven flow from her Immaculate Conception.The end balances the beginning, both having their profound reason in Mary's mission as the Theotokos..."
Written not long after the devastation of World War II, the encyclical conveys the hope that meditation on Mary’s assumption will lead the faithful to a greater awareness of our common dignity as the human family. In the dogmatic statement, the phrase "having completed the course of her earthly life" was carefully written to leave open the question of whether or not Mary died before her Assumption, or whether, like the Assumption of the Prophet Elijah, Mary was assumed before death; both possibilities are allowed in the formulation. 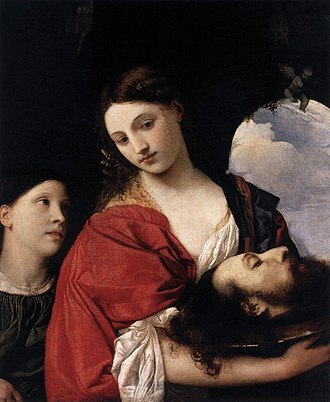 In articles 14, 17 and 20 of the dogmatic pronouncement, however, it is stated that Mary had indeed died: "...the dead body of the Blessed Virgin Mary remained incorrupt, but ... she gained a triumph out of death, her heavenly glorification after the example of her only begotten Son, Jesus Christ...". The entire decree (and the title itself) is also worded to suggest that Mary's Assumption was not in any sense a logical necessity, but rather a divine gift to Mary as Mother of God. Munificentissimus Deus teaches that Mary lived and completed her life as a shining example to the human race. 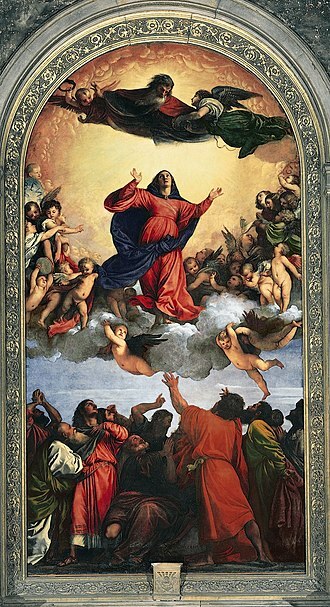 The gift of her assumption is offered to all the faithful and signifies what to hope for at the end of time. Her assumption signifies God's intention to all those faithful to Him. "Thus, while the illusory teachings of materialism and the corruption of morals that follows from these teachings threaten to extinguish the light of virtue and to ruin the lives of men by exciting discord among them, in this magnificent way all may see clearly to what a lofty goal our bodies and souls are destined. Finally it is our hope that belief in Mary's bodily Assumption into heaven will make our belief in our own resurrection stronger and render it more effective." Paul Tillich asked fellow Protestant theologian Reinhold Niebuhr in March 1950, about eight months before the decree was promulgated, if he expected the Pope to make the declaration about Mary's assumption ex cathedra. Niebuhr replied: "I don't think so; he is too clever for that; it would be a slap in the face of the whole modern world and it would be dangerous for the Roman Church to do that today". ^ Tillich, Paul. A History of Christian Thought: From its Judaic and Hellenistic Origins to Existentialism (1972), Simon and Schuster, (edited from his lectures and published posthumously by C. E. Braaten), ISBN 0-671-21426-8. p. 224. Pope Pius IX, born Giovanni Maria Mastai-Ferretti, reigned as Pope from 16 June 1846 to his death in 1878. He was the elected pope in the history of the Catholic Church. 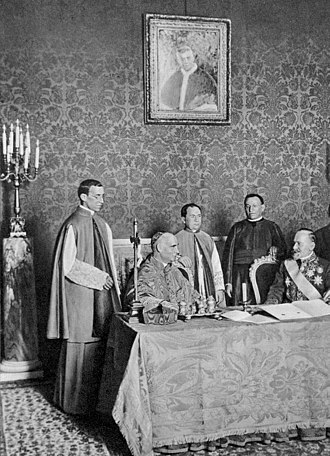 During his pontificate Pius IX convened the First Vatican Council, which decreed papal infallibility and he was the last pope to rule as the Sovereign of the Papal States, which fell completely to the Italian Army in 1870 and were incorporated into the Kingdom of Italy. After this, he was referred to—chiefly by himself—as the Prisoner of the Vatican, after his death in 1878, his canonization process was opened on 11 February 1907 by Pope Pius X and it drew considerable controversy over the years. It was closed on several occasions during the pontificates of Pope Benedict XV, Pope Pius XII re-opened the cause on 7 December 1954, and Pope John Paul II proclaimed him Venerable on 6 July 1985. Together with Pope John XXIII, he was beatified on 3 September 2000 after the recognition of a miracle, Pius IX was assigned the liturgical feast day of February 7, the date of his death. Europe, including the Italian peninsula, was in the midst of political ferment when the bishop of Spoleto. He took the name Pius, after his generous patron and the prisoner of Napoleon Bonaparte. Through the 1850s and 1860s, Italian nationalists made military gains against the Papal States, concordats were concluded with numerous states such as Austria-Hungary, Spain, Tuscany, Venezuela, Honduras, El Salvador and Haiti. Many contemporary Church historians and journalists question his approaches, in his Syllabus of Errors, still highly controversial, Pius IX condemned the heresies of secular society, especially modernism. He was a Marian pope, who in his encyclical Ubi primum described Mary as a Mediatrix of salvation, in 1854, he promulgated the dogma of the Immaculate Conception, articulating a long-held Catholic belief that Mary, the Mother of God, was conceived without original sin. In 1862, he convened 300 bishops to the Vatican for the canonization of Twenty-six Martyrs of Japan and his most important legacy is the First Vatican Council, which convened in 1869. The Catholic Church teaches that Mary was conceived by normal biological means in the womb of her mother, Saint Anne, but God acted upon her soul, keeping it immaculate. The Immaculate Conception is commonly confused with the Virgin Birth of Jesus, jesuss birth is covered by the Doctrine of Incarnation, while the Immaculate Conception deals with the conception of Mary, not that of her son. The defined dogma of the Immaculate Conception regards original sin only, being always free from original sin, the doctrine teaches that from her conception Mary received the sanctifying grace that would normally come with baptism after birth. The definition makes no declaration about the Churchs belief that the Blessed Virgin was sinless in the sense of freedom from actual or personal sin, the Church holds that Mary was sinless personally, free from all sin, original or personal. The doctrine of the conception is not to be confused with the virginal conception of her son Jesus. This misunderstanding of the immaculate conception is frequently met in the mass media. Catholics believe that Mary was not the product of a virginal conception herself but was the daughter of a father and mother, traditionally known by the names of Saint Joachim. In 1677, the Holy See condemned the belief that Mary was virginally conceived, the Church celebrates the Feast of the Immaculate Conception on 8 December, exactly nine months before celebrating the Nativity of Mary. The feast of the Annunciation is celebrated on 25 March, nine months before Christmas Day, another misunderstanding is that, by her immaculate conception, Mary did not need a saviour. When defining the dogma in Ineffabilis Deus, Pope Pius IX explicitly affirmed that Mary was redeemed in a more sublime. He stated that Mary, rather than being cleansed after sin, was prevented from contracting Original Sin in view of the foreseen merits of Jesus Christ. In Luke 1,47, Mary proclaims, My spirit has rejoiced in God my Saviour and this is referred to as Marys pre-redemption by Christ. A feast of the Conception of the Most Holy and All Pure Mother of God was celebrated in Syria on 8 December perhaps as early as the 5th century, note that the title of achrantos refers to the holiness of Mary, not specifically to the holiness of her conception. The Salve Regina, known as the Hail Holy Queen, is a Marian hymn and one of four Marian antiphons sung at different seasons within the Christian liturgical calendar of the Catholic Church. The Salve Regina is traditionally sung at Compline in the time from the Saturday before Trinity Sunday until the Friday before the first Sunday of Advent, the Hail Holy Queen is the final prayer of the Rosary. The work was composed during the Middle Ages and originally appeared in Latin, though traditionally ascribed to the eleventh-century German monk Hermann of Reichenau, it is regarded as anonymous by most musicologists. Traditionally it has sung in Latin, though many translations exist. These are often used as spoken prayers, Marian antiphons have been sung, since the thirteenth century, at the close of Compline, the last Office of the day. Peter Canisius noted that one praises God in Mary when one turns to her in song, the Salve Regina is the best known of four prescribed Marian Anthems recited after Compline, and, in some uses, after Lauds or other Hours. Its use after Compline is likely traceable to the practice of intoning it in chapel. It was set down in its current form at the Abbey of Cluny in the 12th century, the Cistercians chanted the Salve Regina daily from 1218. It was popular at universities as evening song, and according to Fr. Juniper Carol, it came to be part of the ritual for the blessing of a ship, while the anthem figured largely in liturgical and in general popular Catholic devotion, it was especially dear to sailors. In the 18th century, the Salve Regina served as the outline for the classic Roman Catholic Mariology book The Glories of Mary by Alphonsus Liguori. In the first part of the book Alphonsus, a Doctor of the Church, discusses the Salve Regina and it was added to the series of prayers said at the end of Low Mass by Pope Leo XIII. The Salve Regina is traditionally sung at the end of a priests funeral Mass by the decedents fellow priests in attendance, as a prayer, it is commonly said at the end of the rosary. Salve, Mater misericordiæ, dulcedo, et spes nostra, Ad te clamamus exsules filii Hevæ, Ad te suspiramus, gementes et flentes in hac lacrimarum valle. The Angelus is a Catholic devotion commemorating the Incarnation. The Angelus exemplifies a species of prayers called the prayer of the devotee, the devotion was traditionally recited in Roman Catholic churches and monasteries three times daily,6,00 am, and 6,00 pm. The devotion is used by some Anglican and Lutheran churches, the Angelus is usually accompanied by the ringing of the Angelus bell, which is a call to prayer and to spread good-will to everyone. The angel referred to in the prayer is Gabriel, a messenger of God who revealed to Mary that she would conceive a child to be born the Son of God and this is an old devotion that was already well established 700 years ago. The Angelus originated with the 11th-century monastic custom of reciting three Hail Marys during the evening, or Compline, the first written documentation stems from Italian Franciscan monk Sinigardi di Arezzo. Franciscan monasteries in Italy document the use in 1263 and 1295, the current form of the Angelus prayer is included in a Venetian Catechism from 1560. The older usages seem to have commemorated the resurrection of Christ in the morning, his suffering at noon, in 1269, St Bonaventure urged the faithful to adopt the custom of the Franciscans of saying three Hail Marys as the Compline bell was rung. The Angelus is not identical to the Noon Bell ordered by Pope Calixtus III in 1456 and he again asks the faithful throughout the World, to pray for the persecuted Church in the East during the mid-day Angelus. The custom of reciting it in the morning apparently grew from the custom of saying three Hail Marys while a bell rang at Prime. 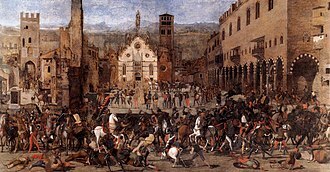 The noon time custom apparently arose from the noon time commemoration of the Passion on Fridays, the institution of the Angelus is by some ascribed to Pope Urban II, by some to Pope John XXII for the year 1317. 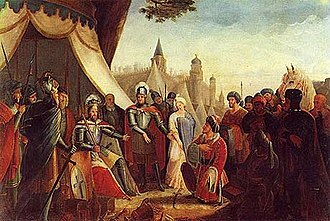 The triple recitation is ascribed to Louis XI of France, who in 1472 ordered it to be recited three times daily, the form of the prayer was standardized by the 17th century. 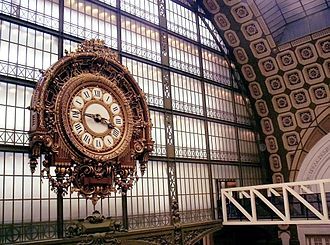 The manner of ringing the Angelus—the triple stroke repeated three times, with a pause between each set of three, sometimes followed by a peal as at curfew—seems to have been long established. The Regina Cæli or Regina Cœli is an ancient Latin Marian Hymn of the Christian Church. Any one of four or of other suitable antiphons may now be sung at any time of the liturgical year. The Regina Coeli is sung or recited in place of the Angelus during the Easter season, as with many Roman Catholic prayers, it takes its name from its incipit or first word. The Latin word coelum, meaning heaven, was a medieval and early modern spelling of caelum. In medieval Latin, ae and oe were both pronounced, the form was influenced by an extremely dubious etymology from Greek koilos. While the authorship of the Regina Caeli is unknown, the hymn has been traced back to the 12th century and it was in Franciscan use, after Compline, in the first half of the following century. He was thereupon inspired to add the fourth line, there are plainsong melodies associated with Regina Caeli, the official or typical melody being found in the Vatican Antiphonary,1911, p.126. The antiphonal strophes of Regina Caeli were often set by composers of the 16th century. Lullys motet Regina coeli, laetare was written in 1684, there are three settings by the young Mozart, and one by Brahms. In the 16th century, the antiphons of our Lady were employed to replace the office at all the hours. In Anglican churches, the translation is in 7.7.7.7 metre. Regina cæli, lætare, alleluia, R. Quia quem meruisti portare, Resurrexit, sicut dixit, alleluia, R. Ora pro nobis Deum, gaude et lætare, Virgo Maria, alleluia. R. Quia surrexit Dominus vere, deus, qui per resurrectionem Filii tui, Domini nostri Iesu Christi, mundum lætificare dignatus es, præsta, quæsumus, ut per eius Genitricem Virginem Mariam, perpetuæ capiamus gaudia vitæ. Gregorian Chant Audio Literal translation, Queen of Heaven, the Son whom you merited to bear, alleluia. Has risen, as He said, pray for us to God, alleluia. V. Rejoice and be glad, O Virgin Mary, for the Lord has truly risen, alleluia. O God, who through the resurrection of your Son Jesus Christ gave rejoicing to the grant, we pray, that through his Mother. According to Catholic theology, there are several concepts important to the understanding of infallible, divine revelation, Sacred Scripture, Sacred Tradition, and the Sacred Magisterium. The infallible teachings of the Pope are part of the Sacred Magisterium, which consists of ecumenical councils. In Catholic theology, papal infallibility is one of the channels of the infallibility of the Church, the infallible teachings of the Pope must be based on, or at least not contradict, Sacred Tradition or Sacred Scripture. The use of power is referred to as speaking ex cathedra. 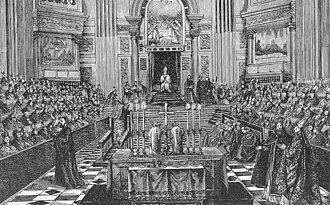 The solemn declaration of papal infallibility by Vatican I took place on 18 July 1870, since that time, the clearest example of an ex cathedra decree took place in 1950, when Pope Pius XII defined the Assumption of Mary as an article of faith. The church teaches that infallibility is a charism entrusted by Christ to the church, whereby the Pope, as head of the college of bishops. The church further teaches that divine assistance is given to the Pope when he exercises his ordinary Magisterium. As with all charisms, the church teaches that the charism of papal infallibility must be properly discerned, the way to know if something a pope says is infallible or not is to discern if they are ex cathedra teachings. Also considered infallible are the teachings of the body of bishops of the Church, especially. In July 2005 Pope Benedict XVI stated during an address to priests in Aosta that, The Pope is not an oracle, he is infallible in very rare situations. Pope John XXIII once remarked, I am only infallible if I speak infallibly but I shall never do that, the limitation on the popes infallibility on other matters is frequently illustrated by Cardinal James Gibbonss recounting how the pope mistakenly called him Jibbons. Catholic theologians in general hold that the canonization of a saint by a pope is infallible teaching that the person canonized is definitely in heaven with God, a decree of canonization commands that the person be venerated by the whole Church as a saint, while beatification merely permits it. 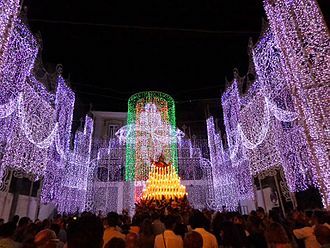 The response demanded from believers has been characterized as assent in the case of ex cathedra declarations of the popes and due respect with regard to their other declarations. On the basis of Mark 3,16,9,2, Luke 24,34 and 1 Corinthians 15,5, the Catechism of the Catholic Church describes Peter as holding first place among the apostles. It speaks of Peter as the rock on which, because of Peters faith, Christ said in Matthew 16,18 he would build his Church, which he declared would be victorious over the powers of death. In Luke 22,32, Jesus gave Peter the mission to keep his faith after every lapse, doctrine-based religions evolve their theologies over time, and Catholicism is no exception, its theology did not spring instantly and fully formed within the bosom of the earliest Church. The doctrine of the Primacy of the Roman Bishops, like other Church teachings, thus the establishment of the Primacy recorded in the Gospels has gradually been more clearly recognised and its implications developed. Marian hymns are Christian songs focused on the Virgin Mary. They are used in devotional and liturgical services, particularly by the Roman Catholic, Eastern Orthodox, Anglican. They are often used in the month of May devotions, some have been adopted as Christmas hymns. Marian hymns are not popular among Protestants, as many Protestants see Marian veneration as idolatry, the practice is very common among Christians of Catholic traditions, and a key component of the Eastern Orthodox liturgy. There are many more hymns to Mary within the Eastern Orthodox yearly cycle of liturgy than in Roman Catholic liturgy, the Magnificat hymn is one of the eight most ancient Christian hymns and historian Marjorie Reeves states that it is perhaps the earliest Christian hymn. The Magnificat is named after the line in the 4th century Vulgate Bible, based on Luke 1, 46-55, and continues to be widely used to date by Roman Catholics, Anglicans. Marian hymns are at times shared among different groups of Christians, for instance, The second stanza of the Anglican hymn Ye Watchers and Ye Holy Ones is derived from the Eastern Orthodox hymn to the Theotokos. In the Eastern Church, the Theotokia are a part of the Divine Liturgy. In the Theotokia people repeat the name Mary many times as a sign of their friendship with her. Parts of the Axion Estin hymn date back to the earliest days of Orthodoxy, in the Eastern Church, the Theotokia often include biblical references that emphasize the mystery of the Incarnation. These Marian hymns have been used in daily prayers since early Christianity as a way to people the Orthodox beliefs. Marian hymns remain a key element in the liturgy of the Coptic Church and are included in every hour, day. The widely used Akathist Hymn to the Theotokos is attributed to Saint Romanos the Melodist who composed many hymns to saints during the 6th century, in the Orthodox weekly liturgical cycle, Wednesday is dedicated to the Theotokos, and all daily services include numerous Marian hymns. These take precedence over the veneration of saints and angels. As of the 12th century a number of diataxeis, giving the order of the liturgy included Marian hymns. The Hail Mary, commonly called the Ave Maria or Angelic Salutation, is a traditional Catholic prayer asking for the intercession of the Blessed Virgin Mary, the mother of Jesus. In Roman Catholicism, the forms the basis of the Rosary. In the Eastern Orthodox and Eastern Catholic Churches, a prayer is used in formal liturgies. It is used by other groups within the Catholic tradition of Christianity including Anglicans, Independent Catholics. Some Protestant denominations, such as Lutherans, use of a form of the prayer. Based on the greeting of the archangel Gabriel to the Virgin Mary in the Gospel of Luke and it has often been set to music, although the most famous musical expression of the words Ave Maria — that by Franz Schubert — does not actually contain the Hail Mary prayer. The prayer incorporates two passages from Saint Lukes Gospel, full of grace, the Lord is with thee, the first of the two passages from Saint Lukes Gospel is the greeting of the Angel Gabriel to Mary, originally written in Koine Greek. The opening word of greeting, χαῖρε, chaíre, here translated Hail and this was the normal greeting in the language in which Saint Lukes Gospel is written and continues to be used in the same sense in Modern Greek. Accordingly, both Hail and Rejoice are valid English translations of the word, the word κεχαριτωμένη, here translated as full of grace, admits of various translations. The text appears in the account of the contained in the apocryphal Infancy Gospel of Matthew. The second passage is taken from Elizabeths greeting to Mary in Luke 1,42, Blessed art thou among women, taken together, these two passages are the two times Mary is greeted in Chapter 1 of Luke. 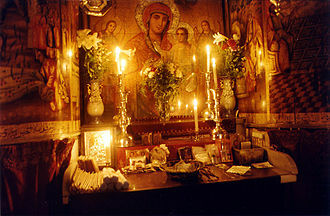 The Hail Mary prayer of the Eastern Orthodox Church and Eastern Catholic Churches is in the form, Θεοτόκε Παρθένε, χαῖρε, κεχαριτωμένη Μαρία, εὐλογημένη σὺ ἐν γυναιξί, καὶ εὐλογημένος ὁ καρπὸς τῆς κοιλίας σου, ὅτι Σωτῆρα ἔτεκες τῶν ψυχῶν ἡμῶν. God-bearing Maid, grace-filled Mary, the Lord with thee, praised thou among women, and praised the fruit of thy womb, because it was the Saviour of our souls that thou bearest. The Serbian Concordat, 24 June 1914. Present for the Vatican were Cardinal Merry del Val and next to him, Pacelli. Our Lady of Kazan has been the subject of devotions both in the Catholic Church and in Eastern Orthodoxy. Eastern Orthodox icon of the Praises of the Theotokos, before which the Akathist hymn to Mary may be chanted. The Magnificat on the wall of the Church of the Visitation. The Vision of St Bernard, by Fra Bartolommeo, c. 1504 (Uffizi). Saint Petrus Canisius contributed to the Hail Mary prayer. The Blessed Virgin Mary as the Virgin of Mercy venerated as The Virgin of the Navigators, 1531–36, with her protective mantle covering those entrusted to her. Fr. Michael E. Gaitley, MIC preaches on the subject of personal Marian consecration. St. Anthony of Padua (1195-1231), one of the first to recommend this practice. Earliest known manuscript of Sub tuum praesidium in Greek, dated between 3th to 4th centuries. 1784 processional banner of the Lisbon Holy House of Mercy depicting the Virgin of Mercy protecting all social classes; the first verse of the hymn is quoted underneath. Statue depicting the Immaculate Heart of the Blessed Virgin Mary as described by Sister Lúcia, the famous seer of Our Lady of Fátima.